Team Europe is preparing for their first game against Team Canada in the best-of-three championship round of the 2016 World Cup of Hockey. However, they’re going to have to do it without forward Marian Gaborik, who has been excellent in the tournament. He was seen early Monday walking around Toronto’s ACC on crutches. Now, Helene Elliott of the L.A. Times reports that Gaborik will miss the next eight weeks of play due to an injury sustained at the World Cup. That’s a blow to Europe’s chances at an upset, but it’s also a blow for the Kings who are hoping that the high-level goal machine Gaborik shows up instead of the Gaborik who has been losing a step and scoring less frequently. Last season, Gaborik scored just 12 goals in 54 games. Injuries continue to be an ongoing storyline in Gaborik’s career. Once he retires, his career-wide production won’t tell the story of how good he was for quite a long time. Here’s a breakdown of the number of games he’s played each season of the last handful of years. Even going back to his time with the Minnesota Wild, who drafted Gaborik third overall in the 2000 Draft, he’s struggled to put together a full healthy season. Though that didn’t stop him from corssing the 40-goal threshold three times. The Tampa Bay Lightning have re-signed Nikita Nesterov to a one-year, one-way contract worth $725,000, the team announced Monday. The 23-year-old defenseman played a career-high 57 games last season, recording three goals and nine points with a -3.03% adjusted CF%Rel. A 2011 fifth-round draft pick of the Lightning, he’s accumulated 84 games of NHL experience over the last two seasons. Back on the blueline! We’ve re-signed defenseman Nikita Nesterov to a one-year contract worth $725,000. After this deal, the Lightning have $5.86 million in cap space remaining, according to General Fanager. That leaves things a little tight with high-scoring forward Nikita Kucherov still unsigned. There’s also the possibility that they offer right-shot defenseman James Wisniewski a contract. He’s with the team at training camp on a professional tryout (PTO). Between those two deals, general manager Steve Yzerman may need to pull out a little magic like he did getting long-term, team-friendly deals out of Steven Stamkos and Victor Hedman over the summer. The Islanders announced three late-addition tryouts on Monday, bringing in 31-year-old forward Steve Bernier and AHLers Connor Jones and Patrick Cullity. Bernier played 24 games with the Isles last season, contributing just one goal and six points in that time. He had struggled in the prior years with the New Jersey Devils but managed to put together an impressive 2014-15 campaign, scoring a career-high 16 goals, tying a career-high of 32 points. But that season proved to be lightning in a bottle that would not be recaptured. Jones and Cullity have both spent time in the AHL and ECHL during their career, have never played an NHL game and played the bulk of last season with the Islanders’ AHL affiliate in Bridgeport. The USCHO preseason polls are coming in, giving a glimpse of what to expect in the 2016-17 season for men’s and women’s college hockey. Nationwide, the reigning national champion North Dakota Fighting Hawks sit atop the heap with 43 first-place votes. Quinnipiac, who fell in the championship to North Dakota, places second with one first place vote. Denver is third, Boston University is fourth (five first-place votes) and Boston College is fifth (one first-place vote), despite losing a truckload of their top players. Rounding out the top ten are Minnesota-Duluth, St. Cloud State, Massachusetts-Lowell, Notre Dame and Providence. In the Big Ten, the University of Minnesota is pegged to take top honors, with Ohio State, Michigan, Penn State, Wisconsin and Michigan State rounding out the list, in that order. Only four players were unanimous selections to the Big Ten preseason player watch list. Those unanimous selections include Justin Kloos and Eric Schierhorn from Minnesota, as well as Penn State’s Vince Pedire and Wisconsin’s Luke Kunin (MIN). In the NCHC, North Dakota has been placed atop the preseason coaches poll. Denver and Minnesota-Duluth are the only other schools that got first place votes. They’re followed by St. Cloud State, Nebraska-Omaha, Miami, Western Michigan and Colorado College, in that order. 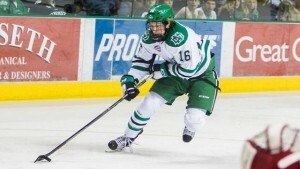 Brock Boeser (VAN) was the lone unanimous pick on the NCHC preseason All-Conference Team. He’s joined on that team by Dylan Gambrell (SJS), Austin Ortega, Will Butcher (COL), Louie Belpedio (MIN) and North Dakota goaltender Cam Johnson. Over in the WCHA, Bowling Green is the favorite in the preseason coaches poll with Michigan Tech the only other school receiving any first-place votes. They’re followed by Minnesota State, Ferris State, Northern Michigan, Bemidji State, Lake Superior State, Alaska-Anchorage, Alabama-Huntsville and Alaska. Ferris State’s senior forward Gerald Mayhew was tabbed as the preseason player of the year in both the coaches and media poll. – Anaheim Ducks prospect Nick Kerdiles has been diagnosed with a concussion. He’s at training camp, but is not playing. He suffered the injury during a rookie camp game. – Hockey East has announced a three-year contract extension for commissioner Joe Bertagna, leaving him at his post through the 2019-20 season.